Beautiful light color. Very soft underfoot. Latex backing is bad news for wood floors, so be sure to use a rug pad. Embrace the tranquility of this richly textured rug from Safavieh's Natural Fiber Collection. 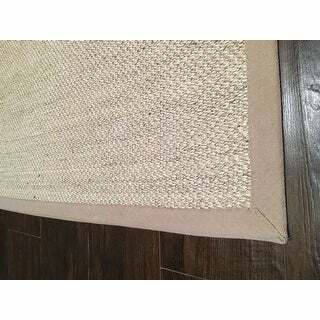 Featuring tightly woven natural sisal fibers with a chic border, this rug gives any room a sleek well-defined look. 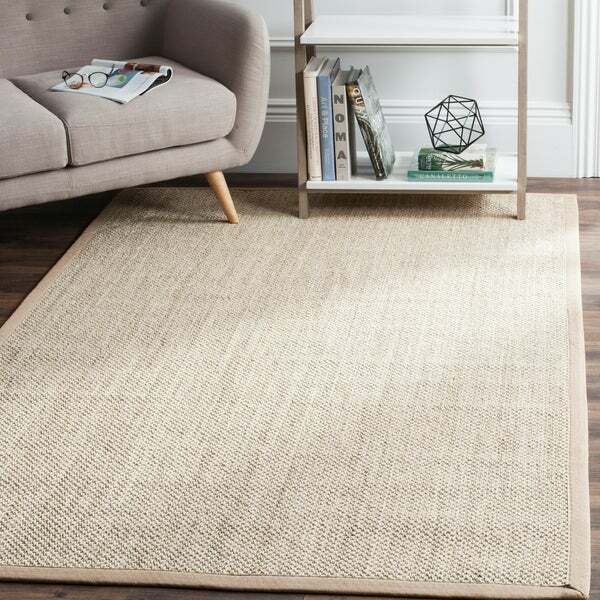 Perfect for numerous types of decor, such as transitional, contemporary, coastal, and farmhouse, this rug can be seamlessly integrated into any home due to its neutral colors. I'm bummed about this rug because it was a great price for the size/material. It's a good thick weave and not rough. I was planning on using it in our guest bedroom but 1. it has a greenish undertone to it so if you have any hint of red near it, it will bring it out. The stock photo shows it against grey-ish wood floors, neutral toned furniture so the rug appears bright warm cream, but my hardwood floors are a rich warm reddish brown so it definitely made the rug appear greenish which is not the look I wanted. In my two photos, I have a grey comforter above it and pale yellow walls. 2. It has a latex backing ("Specs" say it's latex-free but "Details" says it has a latex backing which it does). This is good and bad. Keeps it in place so you don't need a separate rug pad but the rubber rubs off (pills) without even touching it. When I unfurled it, it was all over the place. After laying it down, if you want to move it around, you'll definitely two people since it doesn't glide. 3. The latex back has a strong sour chemical smell. 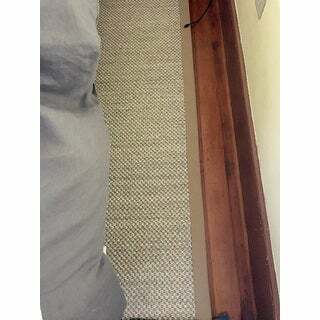 I've had the rug for almost 30 days now and even with the windows open day and night, the smell is still there. It's so strong, my husband won't go in the room because it makes him feel ill. This is a beautiful rug and great quality. The color is very true to the colors in the photos. I definitely recommend it and would order it again. Beautiful rug! This is the perfect natural look for our new house. It compliments the "farmhouse" style, by tying together another great texture. Love this rug! Exactly as pictured! Very light neutral color! Perfect for any room! I now have a set of three of these sisal rugs, to replace very expensive ones that are now 10 years old. I couldn't be more pleased with the quality and look of these rugs. As the description says, there is "marbling" in the color in a few spots, with darker threads running through the straw. I do not mind that. It's subtle and attractive. Very natural. Would buy again. I love my rug! It’s so soft and looks just like the photos online. There was no offensive odor while opening and it layed nicely once taken out of the package. The size was exact and the colors are nice. Please note that the rug’s main color is a very light cream. Hopefully my photos show this. This rug is very well made and I definitely recommend it. Great texture!! Looks natural and very expensive. Color is light and blends well with everything else in the room. Great addition to our guest room!! I love this rug. I actually put a smaller rug, with color, over the top of this rug. It is in my front room. I have had many compliments on it. Highly recommended! This rug I purchased for my cousin because I love my Safavieh sisals so much. It also was of high quality and color was a perfect creamy beige, perfect for the neutral room she was remodeling. Love this rug! It’s a great color! Is a cooler sisal, which goes with my living room so well. Good quality. Love the backing. Takes a few days for wrinkles to fall out. Layered a hide rug on top of this. Easy and affordable piece. Very pretty. Good quality. Would buy again !!! This rug is just as described. It’s not he softest but it’s for under my kitchen table so that works out perfectly. I also like that the backing is nonskid. 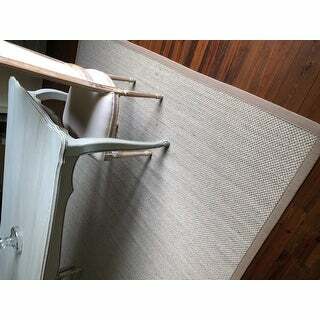 Nice quality, subtle woven design, and surprisingly soft for a sisal rug. I'm always impressed with Safavieh quality, bought many of their rugs and will buying more. "What is the feel of this rug? 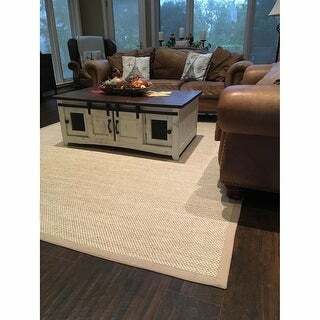 I find many jute/sisal/natural fiber rugs to be stiff and hard under my feet. Is this like that, or does it have any softness to it?" "Hi, what’s the return policy on this item?" "Is this rug recommended for under a dining room table?" While this rug may be used under a dining table, we recommend purchasing a durable rug pad to protect hardwood floors as this is a natural fiber rug. "Hello. 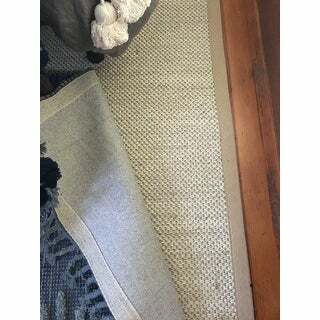 Does this rug come in a size larger, such as 9 x 12?" Hello cinnamon girl, please see ITEM# 18054413 (Safavieh Handmade Natural Fiber Marble/ Beige Jute Rug (9' x 12'). Thanks for shopping with us! "Does this rug have any gray tones in it?" Hello Patricia H., this is more of a natural beige color. Close to grey though. If you have any other questions please let us know. Have a great day!